When past apprentice winner Ricky Martin came to us asking for help on a new project we were more than happy to help. We originally designed the Hyper Recruitment Solutions website back in 2012 and have been working closely with them ever since to make sure their website continues to grow alongside their business. Hyper Recruitment Solutions is a recruitment agency that specialises in scientific and technological jobs, aiming to pair talented and passionate job seekers with the latest job opportunities in the science industry. 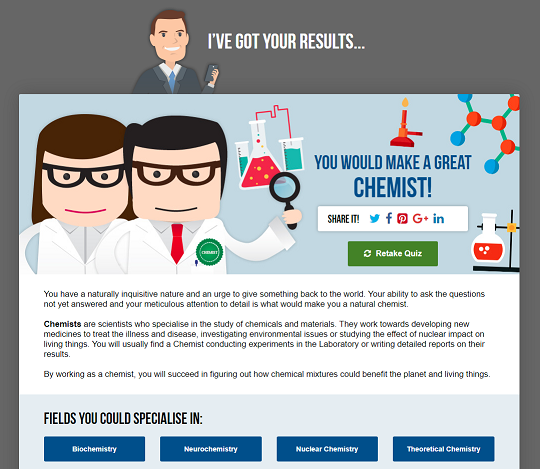 Ricky came to us with the idea of creating a fun and useful quiz that will answer the question 'What Type of Scientist Am I?' So, he gave us full autonomy over the format, design and questions, which our team relished. We planned the quiz, wrote the questions, designed the characters and developed the website, and frankly, we thoroughly enjoyed it! We designed the quiz based on a personality test, with 10 questions and 5 potential answers for each. Based on the answers chosen we would suggest which type of scientist they would be most suited to. This would not only give people an entertaining way to see what job they may be well suited for, but also create more brand awareness for HRS. Following the design and development of the quiz, we also helped with marketing once live. This involved creating a social media plan that would extend its reach by making use of the quiz's share functionality. We also utilised Facebook advertising and Twitter to get the quiz out into the industry. If you would like to talk to us about quirky marketing techniques for your business then we’d love to hear from you. We are not only high-quality bespoke website designers, but we also have over a decade of experience in the world of online marketing and advertising techniques. Contact us today to discuss what we can do for your business. As ecommerce specialists, we were particularly pleased to learn that we'd made Clutch's list of the UK's leading ecommerce developers. Our experienced designers and developers work hard to provide high-quality ecommerce solutions that are tailored to each individual client, and it feels great to be recognised for the quality of the work we do. Visit our Ecommerce Web Design page to find out more about the bespoke ecommerce solutions we provide here at Designer Websites. UPDATE 30/01/18: We have also been named among Clutch's Top UK Inbound Marketing Agencies! What Does The Facebook Newsfeed Update Mean For Marketers? Aah Facebook, from fake news to dog memes you have been keeping us on our toes. Recently Facebook has been ruffling feathers of its advertisers, which seems strange considering the huge amounts of revenue it creates for the social media mogul. But how much will this affect the way we use Facebook to reach out to our customers? Why the sudden change? "We built Facebook to help people stay connected and bring us closer together with the people that matter to us"
"relevant content [that's] helping you have more meaningful social interactions." So what does that mean for the newsfeed? That's apparently enough to have marketers and advertisers shaking in their boots. Sharing useful, meaningful content that people want to see and share? That doesn't sound very us? To an extent, it's not. Most Facebook users are used to seeing brands flogging their products and services and most users have grown accustomed to scrolling away from this newsfeed clutter. But what about the occasional conversion this can encourage? Is it really as bad as everyone seems to think? As usual, the Facebook announcement itself is quite lengthy, but lacking specifics that many marketers are waiting for. For instance, none of the official announcements have specified if this will this affect paid ads. Presumably in some shape or form, but no one has actually mention paid advertising, so maybe those who use paid Facebook ads won't notice too much of a change. However, for those who use Facebook to reach out to people for free, it seems like we'll have to take a different approach. Okay, so Facebook plans to rank content depending on how useful and meaningful this post will be to you, with person to person posts ranking more highly above business and brand posts. Facebook has previously brushed off criticism about its influence during elections and other news scandals and have avoided accusations concerning social media's negative effect on people's mental health. However, this change seems to be an attempt to combat the negative influence Facebook can have and instead become a more positive platform. Quality over quantity seems to be key. - Posting lots won't matter if it’s useless spam. Facebook will value posts that will encourage meaningful interactions, with other people and the post itself. Start creating content that not only shows off your brand but really helps or interests the reader. It something we should all be doing already, but now it's time to really put your back into it. No more clickbait - It just won't work, it won't show up on a newsfeed so there's really no use in it. Besides, titling your blog "You'll NEVER believe this!" to reveal something mundane and misleading is just going to bother readers and do your brand more harm than good. Time to stop with the "Share/like/comment for your chance to win!" posts too, Facebook will just outsmart this transparent tactic. Use the "Prioritise Friend" feature - you'll have to encourage followers to use this tool, we imagine it will take some convincing but if you can it means you'll still show up first in all your most valuable customers feeds. Although this may complicate how easy it is to get your brand out there on social media, it may result in more meaningful responses for marketers too. Long has it been difficult to prove that social media leads to conversions, so perhaps better quality content will help you connect with those with a genuine interest in your business. In theory, this change will value genuine interactions between people, so that when a happy customer of yours recommends you it will actually count for more. As we've said, the other online marketing experts and ourselves can only make educated guesses as what is to come, you'll have to watch this space to see the real impact. As always, when we know, you'll know. If you need any help with your online marketing strategy we are more than happy to help. Call our team of friendly experts for advice on your website design or digital marketing. Please get in contact with us today by clicking here. How is Online Search Changing the Way We Shop? Whether you're a Millennial, a Generation Z, or just someone who spends a lot of time online, in this day and age we now expect to be able to get what we want almost instantly. Need somewhere to eat? Google it. Need new headphones? Amazon it. Need to get hold of someone? Facebook them. The internet has given us all the expectation that instant gratification can be had at the push of a button, but how impulsive are we when it comes to parting with our money? How has the online search game changed the way we shop? Well, although it is much easier now to shop online than it is to elbow your way through in-store January sales, many will still choose to research a product before buying. This will vary between shoppers; some will choose to look at a product in a shop and find it cheaper online, and others will do some online research before going into stores. Either way, online research and instore/online shopping now come in hand in hand and that's something to keep in mind when creating your online marketing campaign. People want, but they don't always know what they want. It's human nature; we get an idea but we want to know what everyone else is doing before making a final decision. So to start the research process we turn to a search engine; "cool room inspiration", "Secret Santa ideas", "hair inspiration", sound familiar? With so many options to browse through its no wonder that people look online for ideas when they at a loss as to where to start. Pinterest has built its empire on people's desire to be inspired. Losing the need for any written information, this visual platform gives us everything we need to get inspired all in one place. Social media is a great way to capture customers in their research stage. For visual inspiration, Pinterest and Instagram are great. To extend your reach and try to inspire those who didn't know they wanted to be inspired, Facebook and Twitter are very helpful too. Use hashtags to appear on relevant searches and capture this attention. 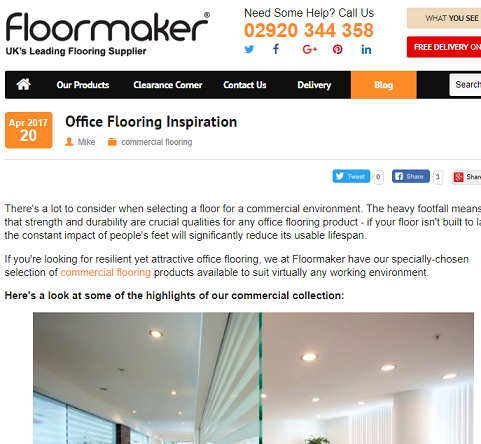 For more product specific searches, such as "flooring inspiration" a blog is a fantastic way to inspire and inform at the same time. Blogs are a vital way of not only inspiring customers but also for getting them to the products you actually sell, which is often where social media can fall short. Relevant, well-ranking blogs don't only attract organic website traffic, they can also give the customer examples of options they can get from you. Although they still may not be ready to make an actual purchase, your brand will be in their mind when they do. "Which is better, Android or Apple smartphones?" "Should I get an Xbox or a PlayStation?" 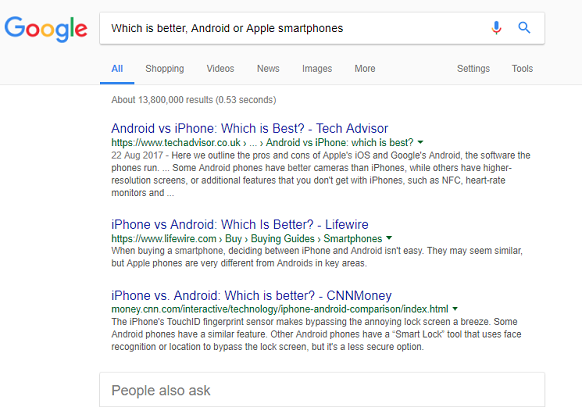 The top result in the snippet box actually seems a lot more bias, with a leading question of "Is an iPhone better than an Android". It seems like the same question I asked originally, but before i've even read the description it gives me the impression that Apple has the edge, later confirmed by the description, so I don't even need to read the full article. Despite this being an older article than the top result, it answers my question quicker. 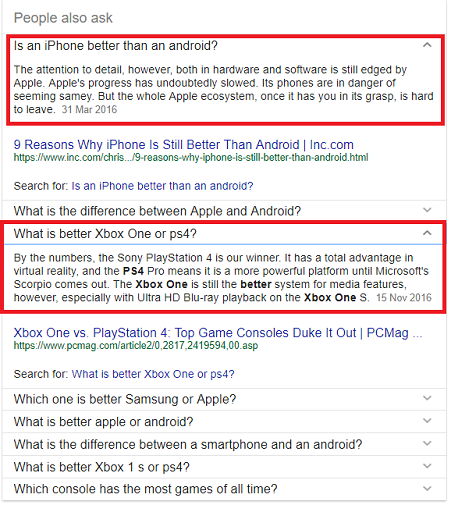 Without even searching for my next question, Google anticipates that I'm also needing advice regarding my Xbox/PS4 dilemma, another 2016 article lets me know that PlayStation comes out on top. So there we go, I'm getting an iPhone and a PlayStation 4 for Christmas (lucky me, right?). Of course, it's not as simple as that, many people will do further research before parting with the money particularly for these pricey items. Which is exactly why blogs are still so important for capturing organic traffic for those who do want more information. 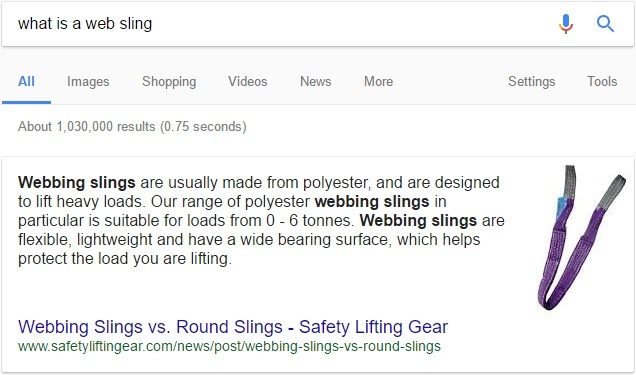 However, it does highlight how important Google featured snippets have become, which is why we have previously written a blog about how to capture a snippet. With any of these products, a large part of it is personal preference, but for those with no opinion formed already, search research may be the thing that swings them either way. It's important to find out what your target audience is trying to research and create useful content that answers their questions, remain informative and interesting to get your opinion across - and do it quickly. In a way, search does also make the selling process far more competitive than when people shop in person. Although you may be able to find a product a couple of quid cheaper somewhere else, half the battle is won by the time you're in the store. Often, it's easier to be slightly unaware that a product is available for a couple pounds cheaper in a different store than to physically go store to store checking, and having to go back to find wherever the cheapest one was. Now I can see the cheapest option, the reputation of the seller and the delivery cost. If I'm quick I can pay a bit extra and get it tomorrow - instant gratification indeed. Clearly, this puts pressure on ecommerce websites who now need to stand out in an over-saturated online market. Be sure to compare your prices and deals with your competitors, ask yourself: How much am I charging for my product/service? Is it still a good deal after delivery? Does my website make the product/service stand out from my competitors? We recently did a blog on how to make your ecommerce website stand out, which you may find helpful. You can find it by clicking here. The way we research online before means that creating relevant content is more important than ever to not only attract traffic to your website but to inform potential customers that what you're selling is worth buying, whether they buy from you instore or online. Inspiring them to aspire to have your product/service is the first step, then its time to explain why you're the best place to make that purchase. Keep an eye on your competitors, the quality of your website and products, and what your customers need from you in order to make the most of search. If you want any advice on your online marketing, from website design to SEO we can help. Contact us today to get help from our friendly specialists.